When animal control came for my dog Katrina, I seriously considered running. I thought about hiding her and denying that I even knew who she was. Instead, in response to the banging on the door, I invited the officers in to meet her and to hear her story. In 2005, Hurricane Katrina destroyed the levees in New Orleans and flooded the city. Among the survivors was a cute buckskin and white Staffordshire Bull Terrier mix. I volunteered with the rescue effort and spent several days with that little dog while she weaseled her way into my heart. I admired how she could enjoy the simple things like sunbathing and letting the wind blow her ears back, despite the destruction around her. At the end of my stay, and after she went unclaimed, I couldn’t resist bringing her back home with me for a better life in Kansas. Not only was Katrina abandoned after the hurricane, but she was heartworm positive and pregnant. Surprisingly, the city I lived in labeled little Katrina “dangerous” simply because she had a short coat, a blocky head, and a stout, muscular body. In fact, the city told me that prohibiting my dog actually kept residents safer. Instead of seizing my little girl, the city gave me three weeks to get out of their city or get rid of my dog. It was the first time I ever felt discriminated against and powerless. Not only that, but I also found out that I couldn’t go home for Christmas because even my hometown had breed-discriminatory legislation. At the time, I was litigation paralegal. In all my conversations with attorneys, no one could grasp the logic behind prohibiting a specific breed of dog. I honestly didn’t even understand how it was constitutional. Realizing how lucky Katrina and I were in escaping the city, I felt a call to action. I volunteered for a local Pit Bull rescue and started working with Kansas City Dog Advocates. There had to be a way to reason with cities that banned dogs because of their breed and a way to stop cities from running people like me and dogs like mine out of their homes. In 2007, I met Ledy VanKavage. If you have a Pit Bull type dog and you don’t know her, you need to. She probably saved your dog’s life. Ledy works countless hours meeting with legislators, law enforcement and community leaders to ensure communities target dangerous dogs by behavior, instead of by breed. “Talk to your city councilman, meet with your city attorney, go to law school!” she said. And for Katrina, I did just that. Two years later, I started my first year at the University of Kansas School of Law. Like the advocate I knew she was, Ledy invited me to start writing alerts for Best Friends Animal Society that help communities prevent the enactment of breed-discriminatory laws. Soon, I started working on doing away with laws that targeted “pit bulls” in my own area. In 2010, I worked with the City of Topeka to repeal its “pit bull” regulations of nearly 25 years. Knowing that I could spend a weekend at my mom’s house in Topeka with Katrina by my side, the two of us sunbathing, the wind blowing her ears back, was bittersweet. I graduated from law school in May of 2011 and am currently working with over 12 cities on repealing their breed-discriminatory laws. Katrina motivated me to go to law school to save dogs like her, and Ledy gave me the opportunity to advocate for people like me. I made the decision to stand up for my dog, but I didn’t need a law degree to do it. All I needed was Katrina. About the author: Katie Bray is the co-founder and adoption director of Game Dog Guardian, where Katrina has a sponsorship program for rescue dogs in need of heartworm preventative medications). She graduated from Missouri State University and received her juris doctor (JD) from the University of Kansas School of Law. Katie was awarded the Walter Hiersteiner Outstanding Service Award by the law school faculty, which is given to the student whose service to her fellow students, university and community demonstrates the greatest promise for contribution to the legal profession and to society. She is the founder of the KU Student Animal Legal Defense Fund and worked for Best Friends Animal Society while in law school. Prior to law school, Katie worked for the city attorney’s office in Springfield, Mo., for several years and worked in the complex litigation field for nearly five years. She volunteers for her local county animal response team and is a former board member of the Mid-America Bully Breed Rescue. 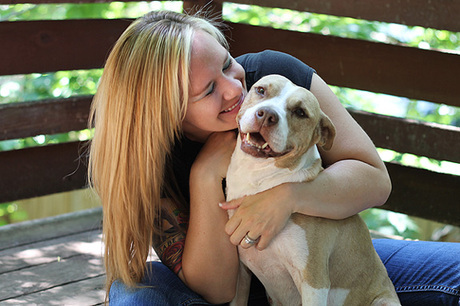 Katie has volunteered for various animal shelters and breed-specific rescues, worked mass spay and neuter clinics, and coordinated the successful adoption of hundreds of bully breed dogs. She has also traveled to various locations to help with large-scale animal rescues and dog fighting seizures, and assisted law enforcement with the evaluation of seized dogs.